The ultimate selection of gift sets and starter kits for fans of bareMinerals, you’ll find everything from sensational skincare to the best in bareMinerals beauty in this covetable collection. Including great value duos, in our bareMinerals collection you’ll find an array of your favourite bareMinerals cult foundations perfectly paired with their best-matched brush. So whether you’re shopping for BAREPRO or bareSkin, you’ll find your perfect match on Gorgeous. Our expertly paired duos will also enable you to stock up on your favourite bareMinerals Original Foundation and Mineral Veil pairs, so you’ll never have to go without them again. The latest gorgeous gift sets from bareMinerals can also be found on Gorgeous Shop, ideal for treating yourself, or a loved one! Alongside seasonal limited edition gift sets, ideal for birthdays and festivities, you’ll also find beautiful starter kits enabling you to try some of your bareMinerals favourites alongside a few new treats! With bareMinerals being pioneers of mineral makeup, it’s no surprise their foundations have become cult favourites. bareMinerals’ Original Foundation is a best seller across the globe, thanks to the brand’s flair for facial cosmetics, and it’s easy to see why. Made with just five mineral ingredients and providing beautiful, buildable coverage with a naturally luminous finish, the award-winning mineral foundation protects your skin with SPF 15 and diminishes the appearance of imperfections without drying skin out. You’ll be able to find this face favourite stocked up on Gorgeous Shop, with great value duos to help you make the most of your radiant look. You’ll also find bareMinerals’ full wardrobe of foundations on Gorgeous Shop, with over 30 different shades and a finish to suit every skin type. From BAREPRO Performance Wear Liquid Foundation to bareSkin Pure Brightening Serum Foundation, Gorgeous Shop’s your go-to for finding your foundation fix. 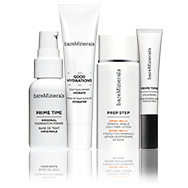 For those seeking a sheerer finish, the bareMinerals Complexion Rescue Hydrating Tinted Cream can also be found on site. Offering a skin-quenching formula, Complexion Rescue replenishes skin whilst creating a natural-looking dewy coverage. bareMinerals’ iconic range of concealers can also be found on Gorgeous, including Complete Coverage Serum Concealer and the NEW BAREPRO 16-Hour Full Coverage Concealer. With iconic formulas loved by beauty teams at the likes of Grazia and Cosmopolitan, Team Gorgeous are also big fans of these innovative and hard-working complexion correctors! Our range of bareMinerals beauty also includes an array of complexion boosting primers, beautiful blushers, gorgeous bronzers and radiance boosting highlighters. From the classics to the limited edition must-haves, we pride ourselves on offering the best value deals on your bareMinerals face favourites. The skin-loving pressed powder designed to create a smooth, healthy complexion! Reveal softer, smoother, younger-looking skin with cleansers, moisturisers & treatments. Your foundation & eyecolours are here to stay thanks to Prime Time Foundation & Eye Primers. Velvety smooth & unbelievably blendable, these vibrant, stay-true shades can be mixed & matched for endless looks. You’ll love the luscious, vibrant sheer-to-full colour of the lipsticks, lipgloss & lipliners. Face, cheeks, eyes and lips…prepare to be swept away. 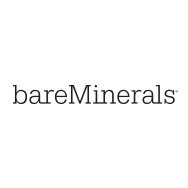 View all bareMinerals makeup in one place. Not sure what you are looking for? Simply select your skin requirement and product type. In the world of beauty, bareMinerals has always been different. bareMinerals was created over 35 years ago in San Francisco, a city full of artists and innovators that inspired a different way of thinking. bareMinerals felt able to follow their gut instincts to create products like no other brand, with natural ingredients and no nasties. With a strong army of fans around the globe, bareMinerals has built incredible loyalty with their customers, who first fell in love with bareMinerals foundation, and this is often the starting point for those looking to change over to more skin friendly, natural cosmetics. With 30 shades of Original Foundation available, finding a true-to-you shade couldn't be easier. We couldn't hide our excitement when we saw some of our beauty icons joining the ranks. Original Foundation has been a makeup bag must-have for over 20 years – Here’s Why! As pioneers of Mineral make up, bareMinerals Original Foundation SPF15 continues to be a best seller throughout the globe. Using the bareMinerals Swirl, Tap, Buff application technique, Original Foundation provides flawless coverage with a naturally luminous finish, never clumpy or cakey just a soft silky texture that looks like a powder but feels like a cream. With its natural ingredients and skincare benefits, it’s a make up that is so pure you can sleep in it! bareMinerals has since gone on to create a full wardrobe of foundations, with up to 30 different shades and numerous finishes, you are sure to find not only your perfect colour match but flawless coverage in a texture you’ll love. Matte Foundation reduces shine of those with oily skin, whilst the active skincare benefits of tea tree oil contained within Blemish Remedy Foundation treats and covers problem skin. BarePro Performance Wear is the option for you if you are looking for a medium to full coverage, that lasts all day. Breathable pressed mineral powder that is clinically proven to stay put for up to 12 hours, and in a sleek compact it’s perfect for on the go. Your skin will love Complexion Rescue Tinted Hydrating Gel Cream with marine botanicals to give your skin a powerful boost of hydration throughout the day. Complexion Rescue has a gorgeous light weight texture that glides on effortlessly. It’s like the best of a BB, CC and tinted moisturiser all in one to give you that healthy, dewy looking complexion – perfect for summer too as it contains SPF30 for great protection. Light years away from the texture of a liquid foundation is BareSkin Pure Brightening Serum SPF20 An ultra fine mineral fluid that transforms your skin in only two drops yet provides buildable coverage for your desired finish. BareSkin Serum Foundation is bursting with beneficial skincare ingredients, Lilac Plant Stem Cells and Vitamin C help to reveal a more even looking skin tone, and offers noticeable improvement against dark spots with frequent use. bareMinerals makeup also provides a wide range of gorgeous lip products, amazing eye palettes and a whole host of blushes and bronzers to create your naturally beautiful look. Great looking skin starts with great skincare, so before you start on your bareMinerals journey consider their Skinsorials skincare range. Results driven cleansers, moisturisers and corrective serums, like bestselling bareMinerals Skinlongevity Serum are all formulated with active and natural botanicals, helping to banish blemishes, revive dull skin, diminish fine lines and refine pores, to help you achieve your most naturally glowing complexion ever!